If the closest you usually come to gardening is buying cress from the supermarket (which, let’s be honest, will probably die before you eat it anyway),having your own herb garden might seem like a bit of a stretch. Don’t give up, though; your fingers probably have a green enough tinge for you to grow a no-nonsense herb box on your windowsill. Head out to your local garden centre and pick up a planting container, compost and two or three small herb plants; thyme, oregano and basil all grow really well on a sunny windowsill but you can grow pretty much whatever you like. Don’t be tempted to buy plants from supermarkets as these have usually been force-grown and will die quickly. For a more unique look, why not plant your herbs into smaller pots and stand them inside mismatched teacups from a charity shop? Or, if you’re feeling crafty, use blackboard paint to carefully decorate a terracotta plant pot, allow to dry and write on the names of the herbs with chalk. Keep your herb plants well trimmed so that they don’t out-grow your containers. If you find you have more herbs than you need, you can store them in your freezer for later use; just put them into a sandwich bag or pack into ice cube trays then label with the date and contents. Basil will grow well on a warm, well-lit windowsill and can be used in everything from salads to pesto. 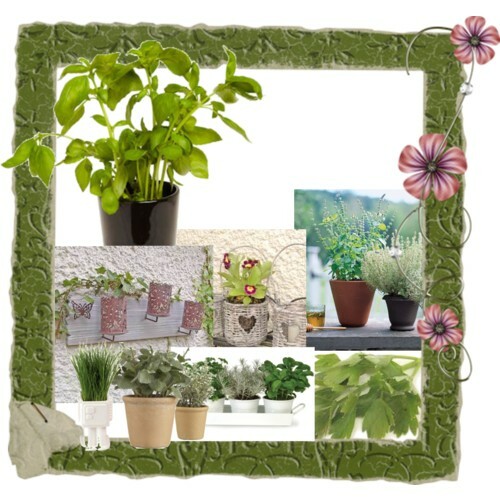 For something a little more interesting, look out for scented or purple-leaved basil plants. Traditionally used in stuffings, sage is a great aromatic herb which can be used to flavour roasting meats and stocks or chopped and added to pasta dishes. As long as sage is grown in a well-lit position, it makes a hardy and useful addition to any windowsill herb garden. Mint plants of almost all varieties are well known to be extremely hardy, so this is a good choice for even the most amateur windowsill gardeners! Mint can be used to flavour boiled potatoes, blended into a mint sauce or even to create home-made sweets. Next Story → Get the BBQ you’ve always wanted!